Free iSMS v1.20 Symbian adalah aplikasi yang berfungsi sebagai pengganti fitur sms yang ada pada ponsel symbian dengan tampilan ala iphone yang atraktif serta dinamis. Aplikasi ini support untuk ponsel symbian s60v3, s60v5, s60^3, dan yang lebih tinggi. 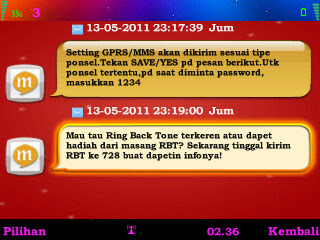 Selain mempunyai tampilan interface layaknya ponsel iphone, iSMS juga dapat menampilkan percakapan sms layaknya sebuah chatting yang menarik dan terlihat elegan jika di banding fitur sms bawaan ponsel symbian. Banyak fitur yang di bawa pada versi iSMS v1.20 ini, serta perbaikan masalah yang sudah di optimalkan. New skin format support, more easily create a personalized love messages. Simplified skin production, installation and management functions, the skin used to choose the way coverflow, the skin effect of real time preview, dynamic presentation. Chat dialogue interface add a picture expression support, send messages to visualize bubble selection and insertion. Contact Interface Add “to add, clear picture” function, support jpg, png and other common image formats, picture settings and contacts within the contact head independently, and supports batch import picture. Added functionality to ignore iPhone style tips: 3rd edition phones can be prompted by the # key closed, 5th Edition mobile phone users can click the upper right corner of the red cross tips off tips, but does not change the state of new information. For 5th Edition Touch platform, the contact interface, new gesture support: contact entries on the left in the program contacts the right plan can be labeled and unmark operation. iSMS add fetion function, It will convenient for the user to use. iSMS support using fetion number to login fetion function. Auto start for fetion function:fetion function will auto start after you setting fetion configurations. Double click will insert expression on flatform Symbian S60 5th and Symbian^3. new love chat, fetion, SMS three-channel intelligent choice, free chat with ease. love to talk new picture file transfer features, support for local transmission of the picture file, and the scene photographed files. love added voice chat file transfer functionality, supports local voice recording file transfer file transfer and the scene.